I love to show my appreciation to our volunteers for the hard work they put in. We finished the summer project last Saturday and I baked these up as a treat on Sunday. I call it “random acts of cupcakes”. You might call it baking up a storm and sharing the goodies with the neighbours. Either way we all benefit. Now before I start a row with my Irish readers I need to point out that this is a cupcake and not a bun. A bun is baked in a buncase in a bun tin, is about half the size and comes out far wider at the top than at the bottom. A cupcake (in my book) is baked in a muffincase in a muffin tin. There is very little variation in size between the top and the bottom of the cake. It’s also huge so probably best for sharing if you’re watching your calorie intake. This recipe came about because I was tired of the cloying flavour that an all butter cake brings. I love cooking and baking with yoghurt as a fat alternative and have been testing the recipe for a long time. The centre is filled with a tart lemon curd which has far more lemon than normal. This is to balance the sweetness of the cake and the icing. The frosting or icing is from my simple icing recipe and is flavoured with the juice and grated rind of 1 organic lemon. They would be equally as delicious with the addition of 50g of poppyseeds when mixing the batter. The yoghurt in the cake batter keeps the cupcake moist for a number of days in a dry sealed container in a cool place. Actually for far longer than a normal cupcake made with an all butter batter would so this is the reason why the quantities make 20, rather than my normal 12. Line your cupcake trays with the cases. Place your jug onto the weighing scales and weigh the following directly into the jug: yoghurt, milk, eggs. With the large spoon portion out the cupcake batter into the cases, taking care not to fill more than 3/4 (three quarters) of the way up the case. Once cool remove the lemon curd from the jar and grate the rind of 1 lemon and squeeze the juice of 1 lemon into the curd then stir well. If you are using shop bought that’s okay too. 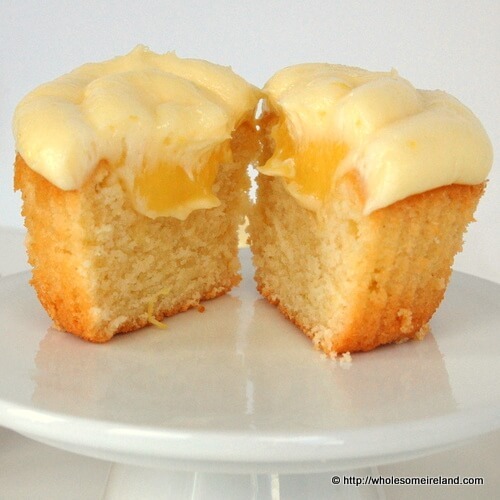 Using your knife cut a small well in the middle of each cupcake and fill with the lemon curd so that it’s level with the top of the cupcake. Follow my instructions for simple icing / frosting and then pipe or spread on top of the cupcakes. If you’re me, you’ll serve with a giant mug of tea. Chantelle I can’t decide whether chocolate or lemon cake is my favourite flavour. This is in my top 10 of homemade treats either way! I knew this are muffins, but you made me uncertain if I know what buns are. I thought they are bread rolls, or eventually tiny sisters of bread rolls. Anyway they look delicious, I love lemon flavours. They look delicious. I would love to try them but the recipe seems to have a lot of sugar. Thanks Martina. You’re right. I rarely bake them as I rarely bake sugary treats at home anymore. They are delicious but a seldom-enjoyed treat.